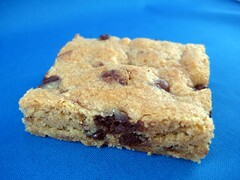 Malted flavor is such a wonderful addition to a blondie. Lovely job. I love your comment about your taste buds being dead. People think that of me all the time, because I love spicy foods. Though sharp vinegar is on the list too (and malt vinegar on french fries). I will have to try this and see if it is too malty for my husband. I made these last week and they were a BIG hit here! I ended up doubling the malt powder as my household loves anything malt…and loves it a lot! I didn’t have any Whoppers hanging around when I went to make these but found 2 Cadbury milk chocolate bars in with my stash of baking chips. I chopped them up into chunks and threw them in instead…I really wanted to make these right away and didn’t want to let any time waste away while I got my behind to the store to pick up Whoppers!